There is still time to shop Veterans Day Sale at U.S. Kirkland's stores and Kirkland's online! 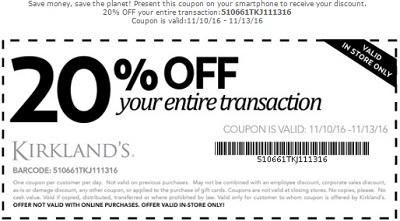 In-store: print the coupon, bring it to your nearest U.S. Kirkland's store, show the coupon to cashier and receive 20% discount on your entire purchase. Online: use online promo code VETDAY20 at checkout and receive 20% discount on your entire transaction. Source of the information is Kirkland's. The offer ends (11/13/2016). For more details visit any U.S. Kirkland's store or Kirkland's online.